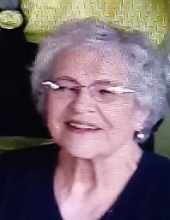 JoAnne M. Coulston of Canton, Age 88, March 16, 2019. Beloved wife of the late E. Lee Coulston. Loving mother of Shirley (Dana) Swanson, Diane (Rick) Lucy, Karen Long and the late Mark Coulston. Dear grandmother of Dawn, Tonia, Nathan, Tony, Shannon, Trevor, Cassie and the late Candice. Great grandmother of Zak, Mia, Bryson, Trevor Jr. and Charles. Dear Sister of James (Alice) and Jack (the late Jeannie) Miller. Funeral Service at the R.G. & G.R. Harris Funeral Home, 31551 Ford Rd., Garden City. Friday at 11:00 am. Visitation will be Thursday from 1-8 pm. In lieu of flowers memorials may be directed to the "American Heart Association". Please share a memory of JoAnne on her tribute wall. To send flowers or a remembrance gift to the family of JoAnne Marie Coulston, please visit our Tribute Store. "Email Address" would like to share the life celebration of JoAnne Marie Coulston. Click on the "link" to go to share a favorite memory or leave a condolence message for the family.